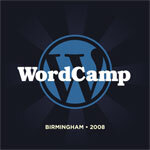 We’ve been slightly quieter than normal this week because of preparing to host WordPress users from across the Southeastern United States at WordCamp Birmingham. the conference begins at the Martha Moore Sykes Studio at the Virginia Samford Theatre at Caldwell Park. They’ll be at Vulcan Park and The Bottletree on Sunday. Registration will remain open until 9 a.m. tomorrow (Saturday) morning, when the fun starts. We’d like to take a moment to direct you to this list of sponsors and supporters of this inaugural conference. And we’d like to invite you to check out the schedule as well. What, you say you want to welcome them to town yourselves though you’re not planning to come to the conference? How about coming out to Jim ‘N Nick’s in Five Points tonight starting at 6 p.m. for an impromptu meetup/Tweetup for Terminal fans and WordCampers. Look for logo. Loving wordcamp so far. Thanks for all of the hard work! Looking forward to the rest of the weekend.